I consider myself one of the lucky ones. I grew up near Boston, Massachusetts and acquired my disability at a very young age. I was adopted from Calcutta, India and at four months of age, I became sick and was diagnosed with transverse myelitis, which left me paralyzed from the waist down. I am one of the lucky ones because at the ripe age of five, I have distinct memories of sitting alongside the curb with my family, watching wheelchair racers go flying by, and many of them were Paralympians. I knew that the Paralympics existed for almost as long as I can remember. I was first exposed to sports at age six. I started competing in the junior national wheelchair games for wheelchair track and field events, table tennis and others at age nine and later competed in ski racing throughout middle and high school as well. As I sit here writing this, I am now a two-time Paralympian in the sport of Track & Field. I am a lucky one because I was taught at an early age to set goals, to dream big, and to learn how to live an independent and successful life. I made the decision to attend college at the University of Illinois in Urbana-Champaign, known for its accessibility and disabled sports programs. While there, actually just after I started graduate school, I decided to get more serious about my racing career and made my first national team in 2007 representing the USA at the Parapan American Games in Rio that year. I was then fortunate to earn a spot on the Paralympic Games team for Beijing in 2008, where I raced in the 100m, 200m, 400m and 4x100m relay and came home with two bronze medals in the 400m and 4x100m relay team. If you can, imagine walking into a stadium of 91,000 screaming fans all there to support you and your dream. The experience was incredible. It was literally a longtime childhood dream come true. 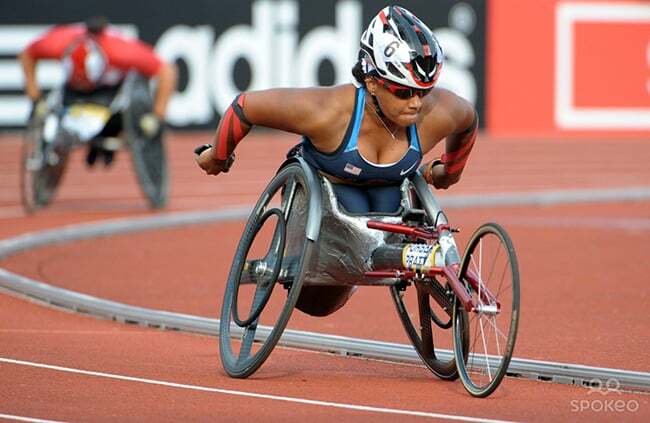 I also competed on Team USA in London at the 2012 Paralympic Games in the 100m, 200m and 400m. While training as an athlete, I completed my Ph.D., and I am now an assistant professor in human and organizational development at Vanderbilt University where I continue to do disability-related research, teach and mentor students. I am also one of the lucky ones because in my adult life, after living with TM for nearly 30 years, through a series of unfortunate medical complications, I rediscovered the TMA and doctors who are a part of our amazing neurology network. While these medical challenges in the past four years have been extremely challenging, I am grateful that one silver lining was joining the Board of Directors of the TMA. Part of my own mission in life is to show others what is possible and help them reach their fullest potential. I am honored to join the advocacy and education efforts with the Board of the TMA. To me, there is power in seeing someone like you and to be a resource for many parents of kids with TM, AFM, NMOSD and ADEM. The researcher in me hopes that myelitis research will continue to get more national attention and we will have more dedicated research dollars to grow and expand intervention and therapeutic opportunities.